A focus on the meaningful relationships that Andean people nurture among themselves and their wild and domesticated environment opens a door towards comprehending the significance of diversity in sustaining complex cultural practices and lifeways in the contemporary world. This collection of presentations examines the tension and co-existence of Quechua culture and modernity in spheres of learning, healing, religion, food cultivation and conservation. Student researchers, who participated in the Center for Social Well Being field school in Peru , share their experiences and analyses of Andean social and ecological values. The session seeks to stimulate discussion on how traditional knowledge should be considered in the creation of local and global policy that contributes to the continuity of cultural and biological diversity. Key words: cultural diversity, traditional knowledge, the Andes . In the Andes , it is culturally significant to recognize and understand the origins and meanings associated with foods. The procurement of food involves complex and highly relevant social relationships. Hundreds of native varieties of potatoes and other Andean food crops, though unacceptable to the Spaniards after the Conquest and replaced by monocropping practices during the Green Revolution, continue to be preserved through ingenuity and generational communication. The indigenous cultivators of the Andes have a profound knowledge of their natural environments and the ability to promote and control diversity. Despite a global decline in biodiversity, indigenous knowledge continues to survive, even where challenged, through non-standard, traditional methods and innovative techniques passed along through generations of families and communities. Community life in Ancash continues to form a base centered on biodiversity, reflected throughout their society. Tuberculosis is the number one preventable cause of death among adults worldwide. 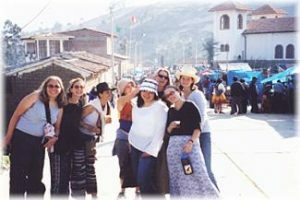 During the summer of 2007, I did preliminary fieldwork in the rural department of Ancash in Peru to study tuberculosis in the context of medical pluralism. Based on participant observation and on interviews with patients, health care workers, and community members, I have analyzed the diversity of medical choices people make with respect to tuberculosis and similar respiratory infections. In this presentation, I discuss factors that influence individuals’ decision-making, such as the distance from health posts and exposure to western biomedicine. In the Andes , non-governmental organizations and communities engage in collaborative environmental conservation projects, bringing the Andean Cosmovision into conversation with environmentalist and technical ways of knowing. How does an understanding of ‘being Andean’ inform NGO praxis and the theory behind it? This research, based on interviews with Peruvian NGO workers in two regions of the Andes , reveals that although staff share some perceptions of the Andean Cosmovision, they articulate different ways of valuing it and incorporating it into their operations. NGO activities may therefore be sites where traditional ways of knowing are reconceptualized as new transnational connections are forged. Children growing up in Cajamarquilla, a small town just outside Carhuaz in the Ancash region of the Peruvian highlands, encounter a variety of traditional knowledges concerning physiology, agriculture and health. These ideologies are deeply embedded in the social processes of Andean life and represent a distinct cultural heritage. My paper focuses on the Peruvian educational system, and how the school house, particularly in Cajamarquilla, acts as a conduit for modern discourses that question and disqualify these traditional Andean knowledges. I emphasize hygiene and physiology as two focal points around which modernity operates. I aim to show that conceptualizing education as a resource, as a tool of empowerment, is far more problematic than expected. The Andean classroom is one of the most contested sites for negotiating identities. A child’s body in the Callejon de Huaylas, Peru , is at once, the terrain upon which both Andean knowledge and Peruvian national identity is inscribed. Though in a condition of state retrenchment, the educational system remains a locus for reproducing a uniform “multicultural” national identity. At the center of this conflict is the production of centralized curriculum in Lima in direct tension with aspirations for greater regional autonomy by educators in the valley. I will attempt to outline the shifting political landscape of cultural identity in the classroom as it represents power realignments between capital and periphery. This presentation examines the spiritual beliefs of the traveling priest Padre Segundo and his practices in the rural hamlets of Carhuaz , Peru . By integrating the teachings of the Catholic Church, the rich local spiritual connection to the land and themes of consciousness raising, this presentation seeks to demonstrate the role of Segundo in the community and the diversity of religion in belief and practice in the Quechuan Andes. The presentation is based upon the recounting of a visit to a small church where Segundo gives a weekly service and from a later one-on-one interview with Segundo.